Toshiba Makes Fast Charging Battery | BlackBerry Blast! 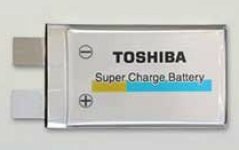 Toshiba has announced a new lithium-ion battery that can be recharged to 80 percent of its capacity in just one minute and it loses only 1 percent of its capacity after 1000 cycles of charging and discharging. Filling the battery up completely takes just "a few more minutes", the company said. This is said to be about 60 times faster than the typical lithium-ion batteries and the fastest charging battery to date. The new battery will start appearing in commercial products in 2006. It will first be used in the automotive and industrial industries but will likely hit the PDA and Smartphone market as well.